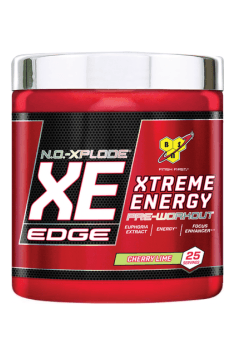 N.O.-XPLODE XE™ EDGE is the result of a global search for a unique blend of botanical ingredients that will help deliver an intense pre-workout formula to have you crushing it in the weight room. Ingredients such as Guayusa, an Amazonian super leaf, Yohimbe, from the West African evergreen, and Macuna, a Tropical legume have been combined with 325mg of Caffeine, 1.6g of Beta-Alanine, and a 1g Citrulline blend to support extreme energy, feel, and focus in 1 scoop. * Get your performance EDGE with N.O.-XPLODE XE EDGE. One portion (1 scoop = 10.5 g) approximately 15 minutes before workout. For best results, should be consumed 10-20 minutes before workout, about two hours after the last meal. It advised not to exceed the recommended daily dose. Individuals sensitive to caffeine or beta-alanine supplementation should start the dosage at half the recommended portion. It's unnecessary to get caffeine from other sources because too much of it may cause nervousness, insomnia or increased heart rate. The content of beta-alanine can temporarily cause a tingling sensation. Calcium glycerophosphate - calcium salt of glycerophosphoric acid. It is used in order to reduce the symptoms of the digestive system in people who are sensitive to the intake of acidic foods and drinks. Its regular application may lead to the pathological decrease of pH of gastric juice, therefore it should be used for these reasons only occasionally. Thanks to the abilities to buffer the acidic-alkaline reaction in the oral cavity, calcium glycerophosphate limits the development of dental plaque. It may also decrease the risk of the development of dental caries, although the issue of its activity requires further research. Due to the content of two main ions building bone tissue in the molecule, phosphorus and calcium, supplementation with calcium glycerophosphate positively influences the state of bones. It increases its mechanical endurance and may decrease the risk of osteoporosis. Calcium glycerophosphate is also used in pre- and post-workout supplements due to its electrolytic and osmotic activity. It positively influences cell hydration, complementing the activity of other active substances, promoting satiation of myocytes with sarcoplasm, reflected in the increase of efficiency of muscle tissue. Longan (Euphoria longana) - a fruit, visually similar and closely related to lychee. It demonstrates wide pro-health effectiveness. It contains many vitamins, including A, D, E and K, therefore it is beneficial to take it with fats in order to maximize the absorption of these vitamins. Moreover, it demonstrates considerable antioxidant properties, thanks to which it decreases the amount of free radicals in the organism. This fruit is also distinguished by the richness of minerals, such as magnesium, iron or potassium. Probably due to the content of these elements, it is attributed positive influence on the nervous system. Longan is supposed to have calming and antidepressant effect. This fruit also contains lycopene, the compound famous for its anticancer properties. Some source also say that longan is a natural aphrodisiac. Lindera (Lindera aggregata) - a tree with a wide range of pro-health applications, dependent on the part of the plant that is used. Fruits are used as a natural laxative and may be helpful in case of constipations. They also demonstrate diuretic properties. Seeds, in turn, may be used during infections, as they demonstrate the abilities to decrease high body temperature. The root of this plant is used in the therapy of painful menstruations. It demonstrates relaxing abilities and is indicated as an effective way to reduce menstrual pain. Positive effects of its application are also noted in the therapy of disorders in the digestive system. It has carminative effect, thanks to which it supports the fight with constipations. It is also attributed anti-inflammatory activity. Lindera aggregata extract also has stimulating influence on the cardiovascular system functions. It increases the strength of heart contraction and promotes venous-arterial flow, positively influencing nourishment of peripheral cells. Thanks to this, it may promote physical abilities.